One of the biggest trends this season is the crop flare jean. It’s a somewhat new silhouette which might leave you wondering how to wear it. 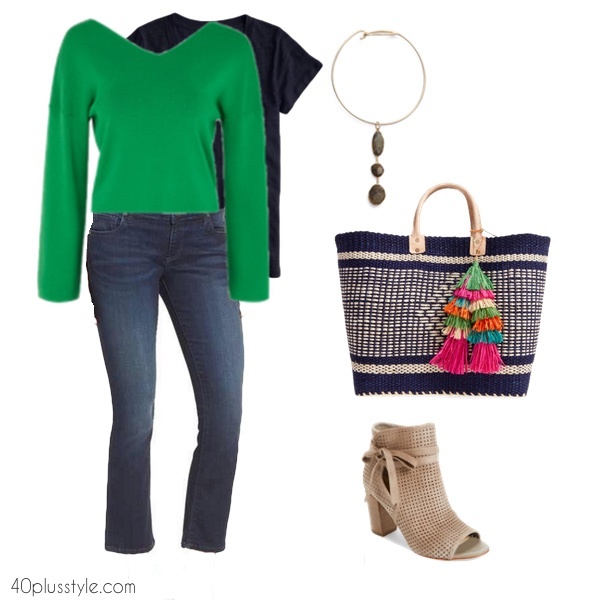 Here are tips on how to style crop flare jeans so that they flatter you and your style and shape. Selecting the right jeans for your shape. First of all, select the right shaped crop flare. You’ll find cropped flare jeans with a very pronounced, flared bottom or jeans with a subtle, small flare that is just at the bottom hem. If you are petite, opt for the smaller flare so it won’t overwhelm you. Also, if you’re just trying out this trend and a bit unsure, try a small flare. It will look chic and fresh without looking too trendy. You’ll find this shape in many rinses from a darker rinse or even white or black denim. The edges of this jean are often shown with a frayed, unfinished edge. If you do opt for this frayed edge, keep the rest of the distressing to a minimum on the jean, so it doesn’t veer into looking too teen-ish. This silhouette can actually balance out larger hips and can be very flattering. And yes, plus size body types can definitely wear a cropped flare jean too. It’s all about proportions and balance by wearing a top that isn’t too long or baggy and selecting a top which accentuates your waistline. 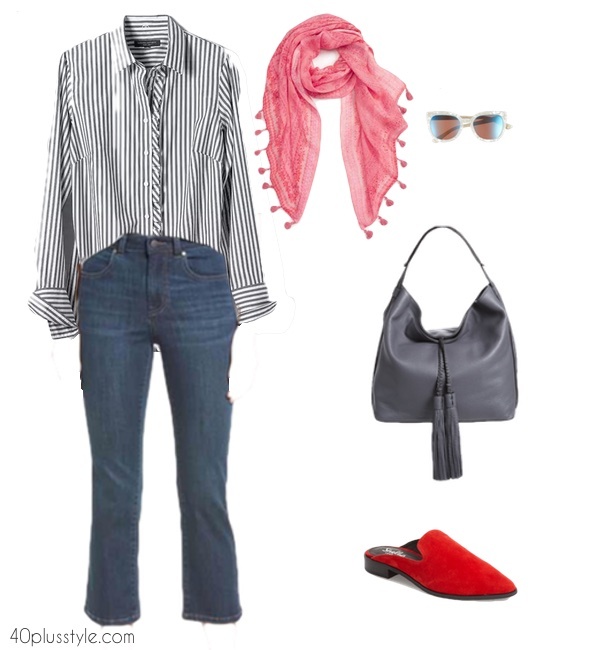 To make the cropped flare jeans appropriate for a casual work outfit or event, pair a darker rinse crop flare jean with a structured, menswear-inspired button down or collared shirt in a ticking stripe. Select a broad cloth, poplin or polished cotton. Either tuck the shirt in completely or do a stylish partial tuck in the front waistband only. You can add a blazer or cropped jacket to add even more polish to your look. A cropped sweater adds balance to a cropped flare jean. The wider hem of the sweater balances out the wider hem of the jeans and looks fresh and updated. Again, the shorter shape of the bomber jacket creates a nice proportion to the crop flare jeans and adds definition to your waistline. Choose a bomber jacket in a crisp, spring pattern. Wear a stylish spring bootie with your cropped flare jeans. The hem of your jeans should end just slightly above your boots or just at the top of the boot so it doesn’t break up your leg and make your legs look short. A very modern look is to pair a backless mule with the crop flare jeans. If you are petite or if you have a longer torso and shorter legs, pair a stacked heel mule in a color that’s similar to your jeans to make your legs appear longer. Are you going to be adding the new cropped flare jeans to your wardrobe? Flared jeans weren’t flattering in the 60s and 70s and they still aren’t. Why on earth have they reappeared when there are so many other styles that don’t require an entire wardrobe makeover so they look “good”. I totally agree with you Greta. Great post Syliva! I have been touting flare jeans for about a year now. I think what has been tricky for women wanting to wear the trend is that the mule shoe, which I think is a fabulous option for crop flares, was slower to catch on. Furthermore, the market did no offer many tops to work with flares as well. This season, as your post shows – there are options for every gal looking to try the trend. Options as you mentioned with the width of the flare, fabulous and flattering shoe options, plus all of the lovely bare shoulder blouses to pair with the look. Thanks Suzanne. You wear them well! I still have not come round to liking these trousers. I don’t know why. After all boyfriend jeans shorten my legs too and I love them. Having no hips rules out bomber jackets and cropped tops as well. So I will let this pass me by. You are right and I am lazy. And skinnies are so right on my figure. No idea what step up jeans are. Skinnies with 7/8 length? Or tapered jeans with 7/8 length? I actually think that these might suit you Greetje as they create more shape and balance out your shoulders. Who knows, if they continue to be on trend you may try them. Although of course it’s perfectly fine to pass on this trend! I wanted to share an additional designer for denim for the plus size ladies. SLINK fits beautifully and has many current fresh styles with sizes starting at a 12W-24W. You can find this designer at Nordstrom. 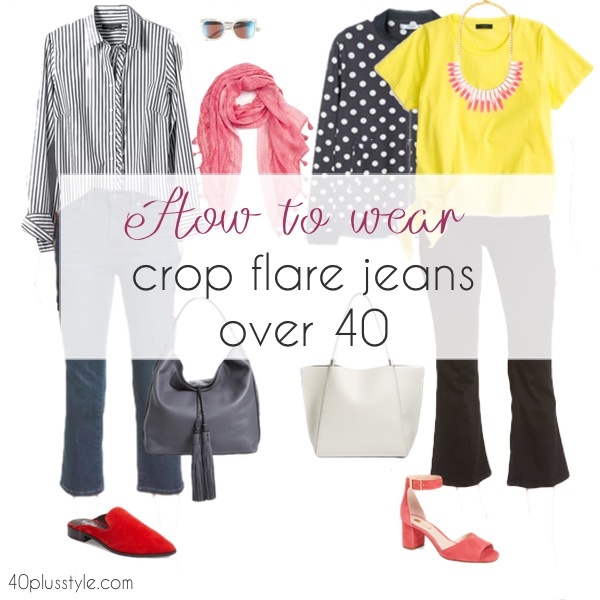 Thanks for the excellent styling suggestions for crop flares. I bought a pair last season to experiment with and like them if styled well. I have an old pair of Michael Kors straight leg “boyfriend” jeans that are somewhat distressed and plan to “crop” them myself. I like the concept of styling masculine jeans with feminine or dressy tops, shoes, jackets and accessories. Previous post: Beauty interview: Rosemond Perdue’s grooming and makeup secrets! Next post: how to wear a short dress 4 different ways! How lovely to have you here! At 40+Style we help women find and ignite their style after 40. Find inspiration from other 40+ women, check out our tips on how to dress after 40 and find out how to find your unique style. To skyrocket your style instantly I recommend the FInd Your Style Challenge!.